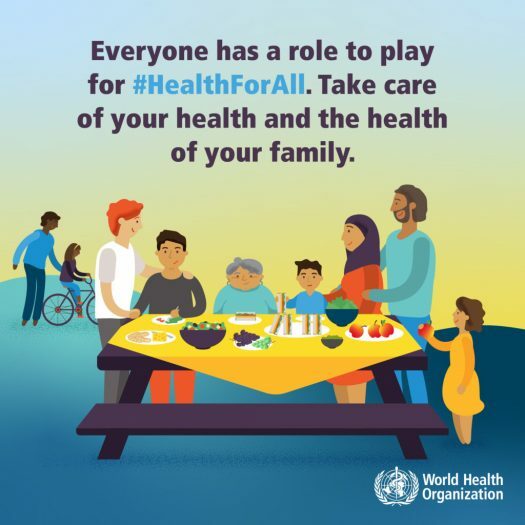 The theme of World Health Day (7th April 2019) is Universal health coverage: everyone, everywhere. World Health Day is celebrated every year to spread awareness among people for better Health. The health of women and girls is of major concern because, in many societies, they are ignored by discrimination rooted in sociocultural factors. For example, women and girls face increased vulnerability to HIV/AIDS. Potential or actual experience of physical, sexual and emotional violence. While poverty is an important barrier to positive health outcomes for both men and women, poverty tends to yield a higher burden on women and Girls’ health due to, for example, feeding practices (malnutrition) and use of unsafe cooking fuels (COPD). The government is providing the Small Babies with the Polio Injections to make them safe from the Polio problems which are very dangerous for them in the future. Eat simple traditional meals freshly prepared from whole foods. Stay away from ready-to-eat, processed and packaged convenience foods straight out of the supermarket shelves. Avoid foods that include refined flour as the main ingredient as it is deprived of all nutrients. Drink lots of water and other fluids like nariyal pani, nimboo pani, buttermilk, herbal teas etc, roughly about 10-12 glasses in summer and about 8 glasses in winter. Adequate sleep is crucial to maintaining good health as it enables rest and recovery. Persistent sleep deprivation can wreak havoc on health.